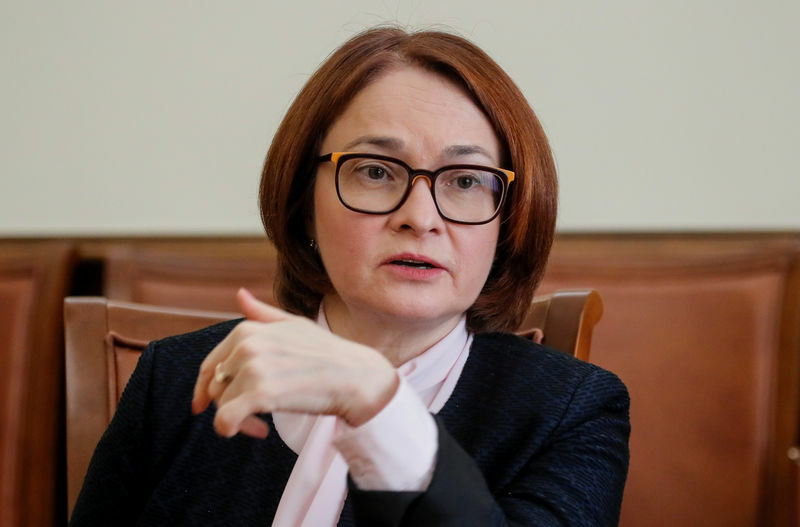 MOSCOW (Reuters) – Russia’s central bank will soon complete its rate-cutting cycle and switch to a neutral monetary policy, although it may have to tighten again if inflationary risks increase, Governor Elvira Nabiullina said. The central bank has been bringing rates down since 2015, when inflation was in double digits, and is now homing in on a level more suitable for current economic conditions – as well as for its inflation target of 4.0 percent. “We should switch to neutral monetary policy in the short run,” Nabiullina said in an interview with Reuters. Once stubbornly high consumer price inflation has been holding steady at an annual 2.4 percent, giving the central bank a chance to end its run of rate cuts now that it has brought its main rate down to 7.25 percent. “For now, we think that the level of the neutral rate is in the corridor from 6 to 7 percent, closer to the upper boundary,” Nabiullina said. But the timing of the next cut remains unclear. Nabiullina did not comment on any rate moves the central bank may consider at its next board meeting on June 15. She said a recent rise in fuel prices was a concern for the central bank as rising petrol prices result in higher inflationary expectations. Still, the central bank does not rule out dipping into deflation in monthly terms in August and September, and it expects annual inflation to read between 3.0 and 4.0 percent by the end of 2018, Nabiullina said. “If some factors emerge which increase inflationary risks, we would need to again switch to a tighter policy,” Nabiullina said. The central bank also has to keep an eye on fiscal policy – the job of the finance ministry, for which it buys foreign currency under a so-called budget rule if oil prices stay above $40 per barrel. That regular buying means Russia’s international reserves could reach $500 billion in the “foreseeable future,” Nabiullina said. “Nevertheless, if the market is either too volatile or too thin, as on public holidays, and our operation could cause extra volatility, we do not carry out operations,” Nabiullina said. Nabiullina said the $40 a barrel level factored into the budget rule seemed justified despite oil’s recent rise to a four-year high. Oil is Russia’s biggest export earner. The central bank is likely to keep its conservative outlook on oil prices but could raise its short-term price forecast this month from the current $61 a barrel, Nabiullina said. Commenting on a possible increase in state borrowing by the finance ministry, Nabiullina said Russia could afford to borrow more from the macroeconomic stability point of view as its debt to gross domestic product ratio is low at around 15 percent.